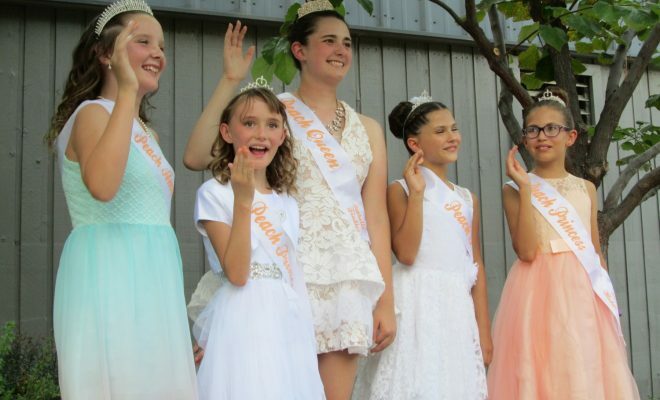 The Palisade Peach Festival Queen and her Court were crowned Thursday. Isabella Findley was crowned Peach Queen. Peach Ambassador was Abigail Lemon. Peach Princesses were Lila Huddle, Eliana Steele, and Shayla Baldwin. Photos by Bill Hoffmann. Large crowds of families and visitors were drawn to the 50th anniversary Palisade Peach Festival, Aug. 16-19. “Welcome Peach Lovers! Peaches have been the lifeblood of Palisade for over a century and we love to celebrate the sweetness and beauty of the world’s best PEACHES,” Juliann Adams, executive director of the Palisade Chamber of Commerce, proudly proclaimed to readers of the 16-page Peach Festival supplement in The Daily Sentinel. Golden peaches, fresh from Palisade area harvest, were abundant at the festival. Sponsors included the chamber and American Warehouse Furniture. Major sponsors also included Safeway and Golden Gate Petroleum. Gold Haven sponsors were Alpine Bank, Grand West Kia, and the town of Palisade. On Thursday, visitors were treated to free peaches and ice cream, the crowning of the Peach Queen and Court, and a street dance and music at 3rd and Main Street. The peaches and ice cream were scooped and served to the long lines of visitors by members of the Palisade town staff and trustees, an annual tradition. The Palisade Peach Festival Queen and her Court were crowned Thursday downtown by Jake Jabs of American Furniture Warehouse. Isabella Findley was crowned Peach Queen. Peach Ambassador is Abigail Lemon. Peach Princesses are Lila Huddle, Eliana Steele, and Shayla Baldwin. On Friday and Saturday, visitors had a selection of 96 vendors, as well as music performances, at Riverbend Park. 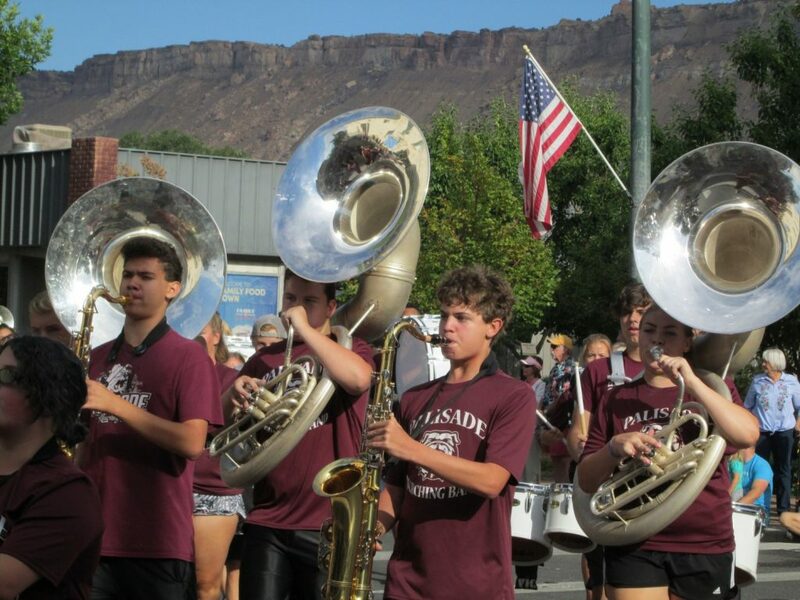 On Saturday morning, people lined streets downtown to enjoy the Palisade Peach Parade. Several marching bands highlighted the parade. Ron Koss was the parade master of ceremonies at 3rd and Main. In Memorial Park, Palisade Lions Club members served eggs, sausage, and pancakes to visitors, who were seated at long tables under the trees. A rain shower early Saturday morning cleared in time for the parade and the breakfast in the park. The day was sunny and cooler. On Sunday, the Farmers Market downtown continues to offer “the best produce in the state,” Adams boasted, as well as food and retail vendors, live music and the shops and galleries downtown. The market continues through Sept. 16. The motto for the 2018 festival was “125 Years of Peaches, 50 years of Festivals.” The first “Peach Festival” held in Palisade was on September 16, 1930, the Palisade Historical Society writes in the Sentinel supplement. The official art and poster for the 2018 festival is a painting by Kay Crane, artist, and director of the Blue Pig Gallery in Palisade. The painting features a blue truck, a dog, and a giant peach. The image is available at the chamber on coffee mugs, mouse pads, t-shirts, and other merchandise. THURSDAY, AUGUST 16. 3RD AND MAIN STREET. 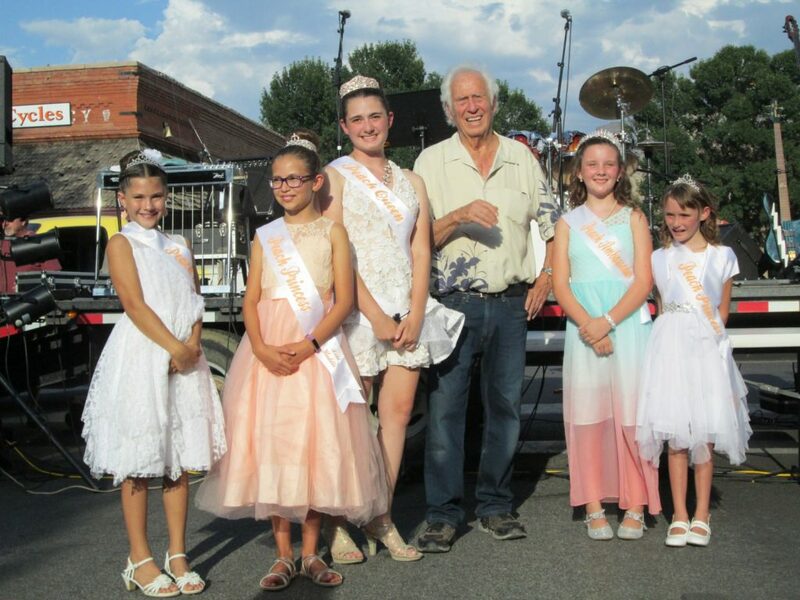 The Palisade Peach Festival Queen and her Court were crowned Thursday downtown by Jake Jabs of American Furniture Warehouse. Isabella Findley was crowned Peach Queen. Peach Ambassador was Abigail Lemon. Peach Princesses were Lila Huddle, Eliana Steele, and Shayla Baldwin. 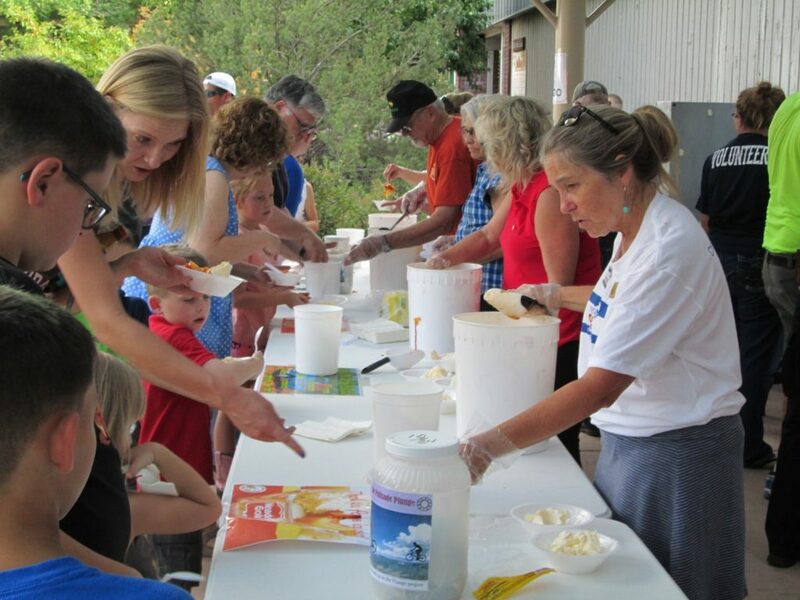 The peaches and ice cream were scooped and served to the long lines of visitors by members of the Palisade town staff and trustees, an annual tradition. 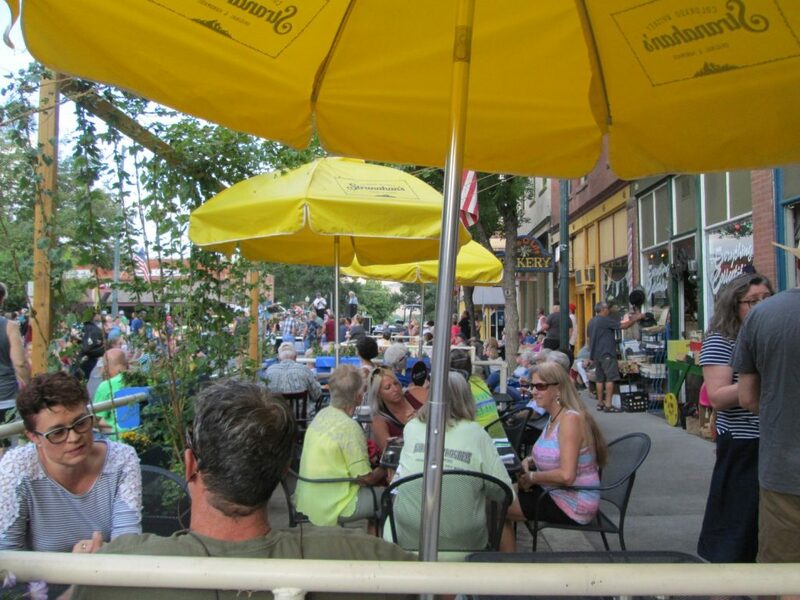 Business appeared brisk at the Palisade Cafe 11.0 on Thursday during Peach Festival activities downtown. SATURDAY, AUGUST 18. PARADE AND BREAKFAST IN THE PARK. 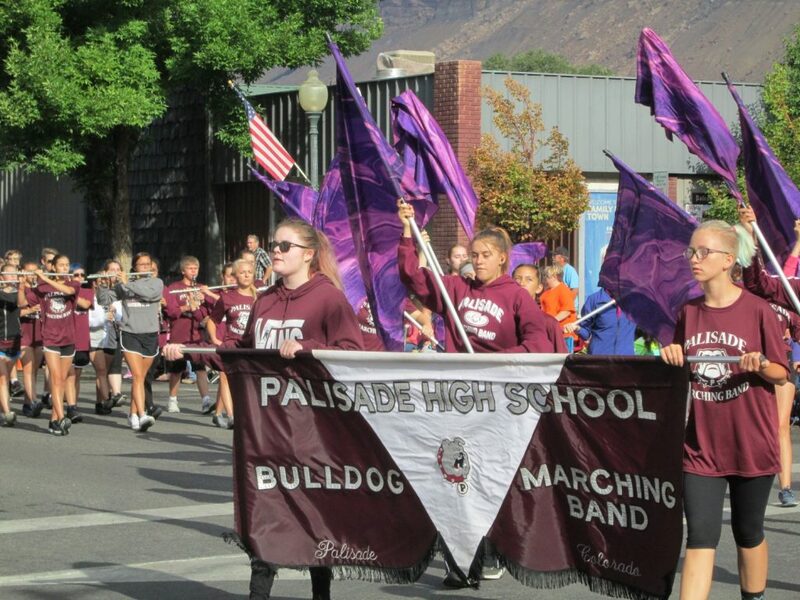 The Palisade Bulldog High School Marching Band was a big part of the parade. 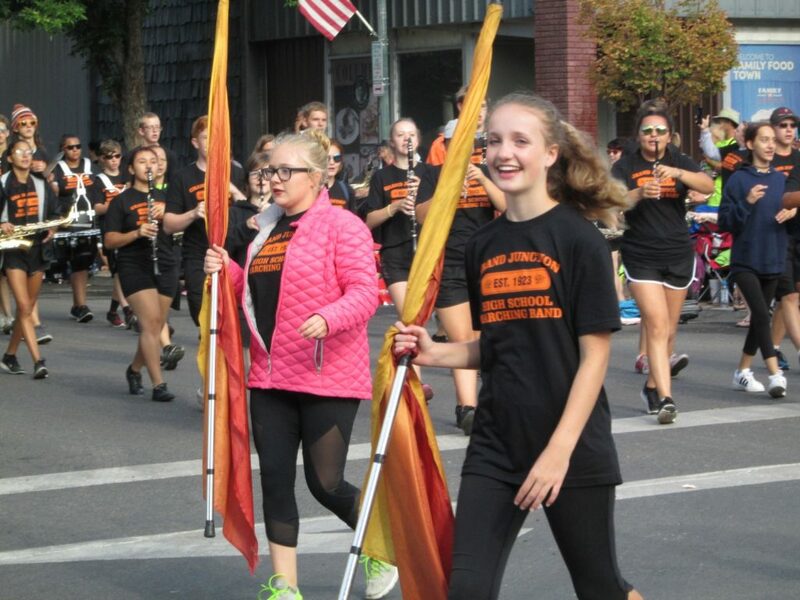 The Palisade Bulldog High School Marching Band is seen in the parade. 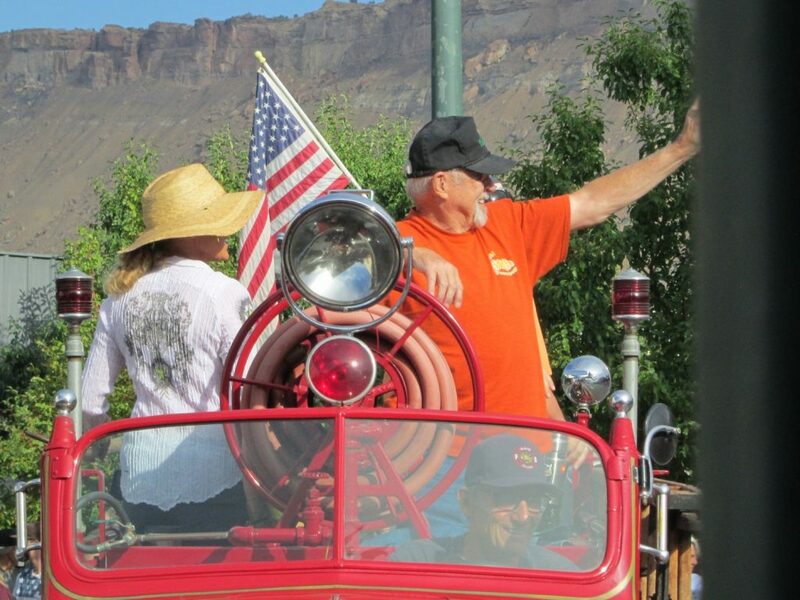 Mayor Roger Granat waved from the Old Red fire engine in the Peach Festival Parade downtown. The Central High School Warriors Marching Band played in the Peach Festival parade. 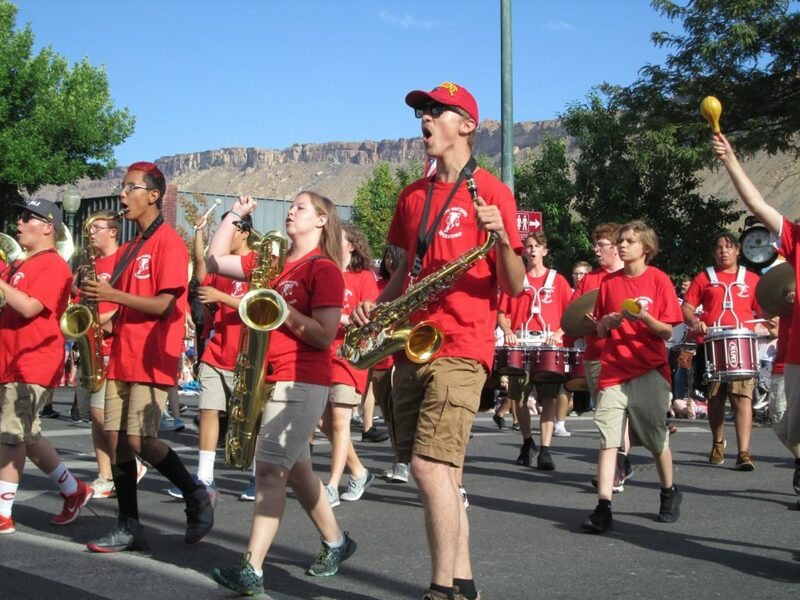 The Grand Junction High School Marching Band was part of the Peach Festival Parade. 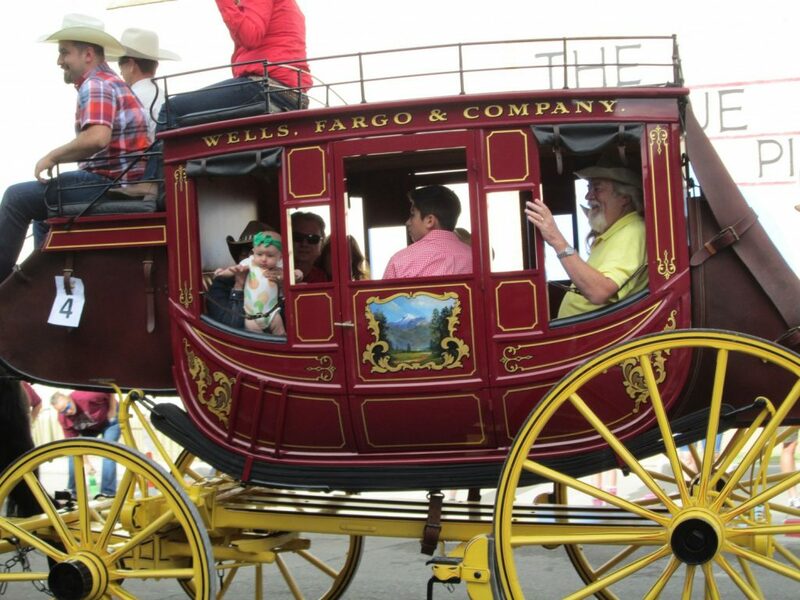 The parade included the Wells Fargo stagecoach pulled by four Clydesdale horses. 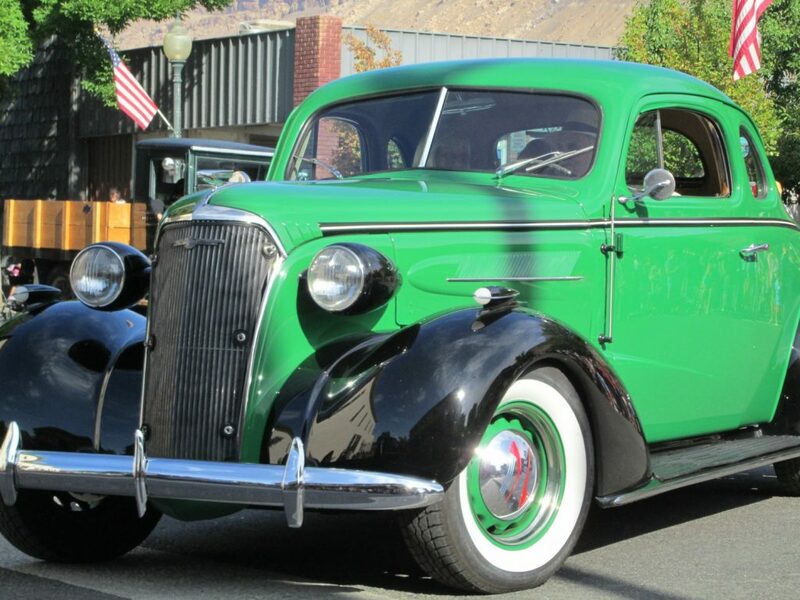 Antique cars in the Peach Festival Parade on Saturday stirred memories for some watching. 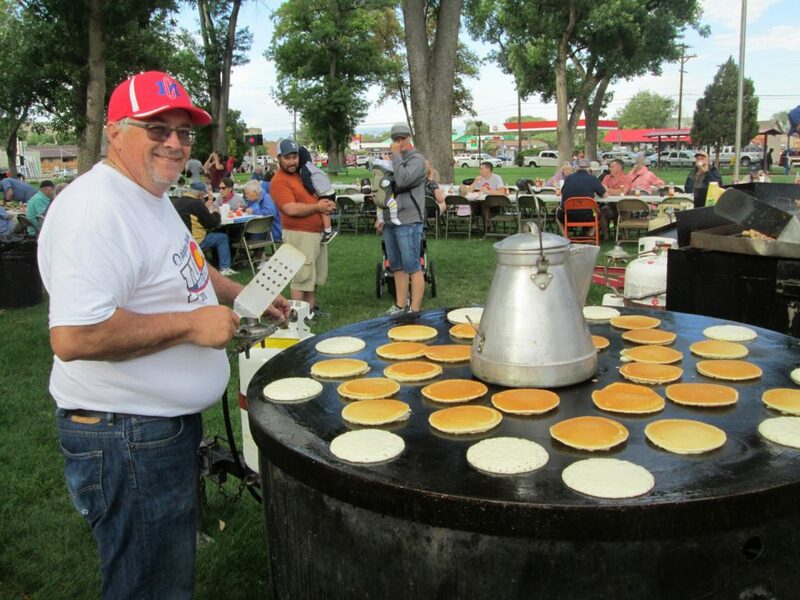 The Palisade Lions Club breakfast at Memorial Park on Saturday featured pancakes. 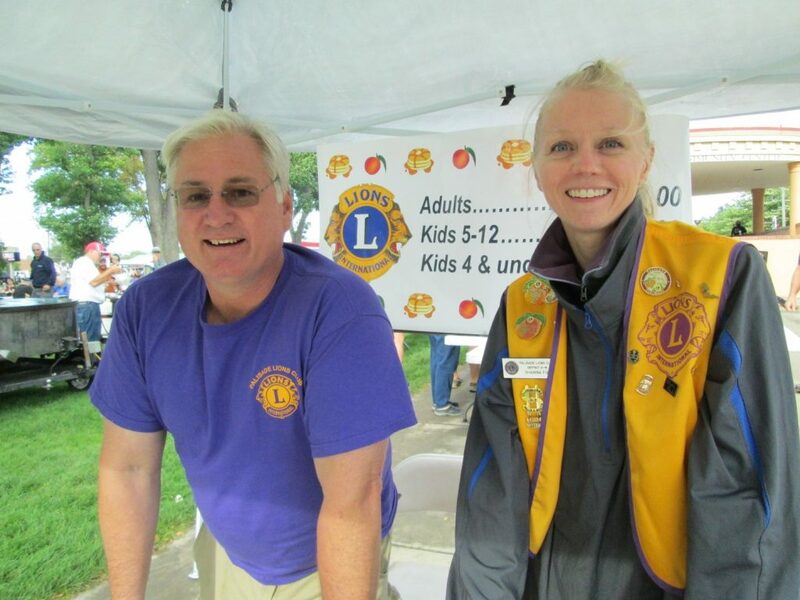 Rick and Shawna Fox staffed the Palisade Lions Club booth for the pancake breakfast Saturday in Memorial Park. 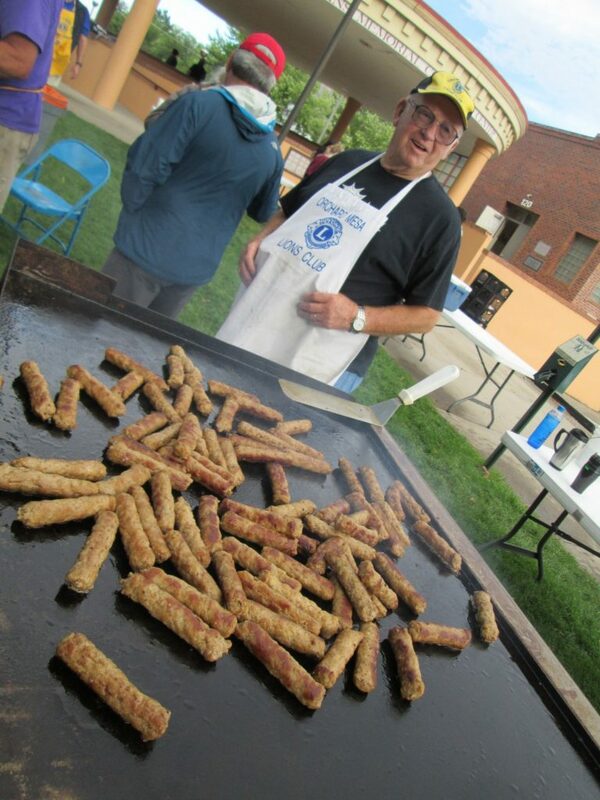 The Palisade Lions Club breakfast at Memorial Park on Saturday included sausages, ready to sizzle.